(VOVWORLD) - North Korean leader Kim Jong-un and US Secretary of State Mike Pompeo have agreed to hold an expert-level talk at the earliest date possible towards the second summit between Mr. Kim and US President Donald Trump. The Korean Central News Agency (KCNA) on Monday reported that during a talk with Mr. Pompeo in Pyongyang a day earlier, Mr. Kim said he believed major progress will be reached at the future meeting with President Trump. 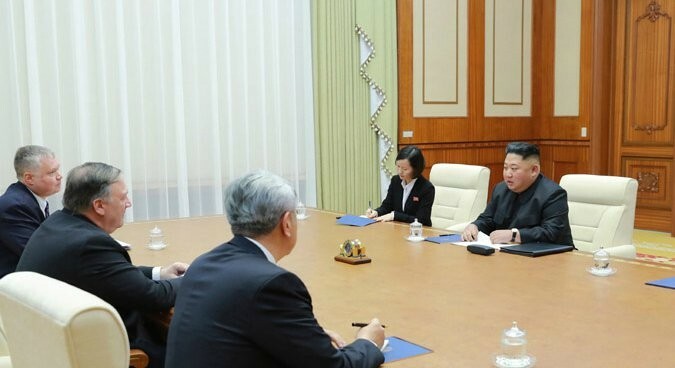 The North Korean leader explained in detail the proposals for solving the denuclearization issue and matters of concern of both sides but the KCNA stopped short of mentioning them. The US State Department announced that North Korea is considering the venue and time for the second summit. Both countries and South Korea expressed their hope the meeting will soon take place through which to clear the deadlock of the denuclearization on the Korean Peninsula.